This brochure would be fitting for any community church wanting to spell out a mission statement, core beliefs, or various programs. The simplistic exterior relates to church members' common journey seeking God's presence in their lives. 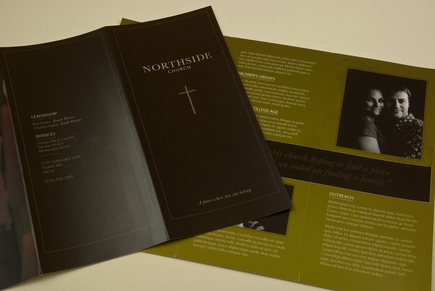 The humble, unobtrusive aesthetic of the brochure creates an image of an inviting church where all are welcome.